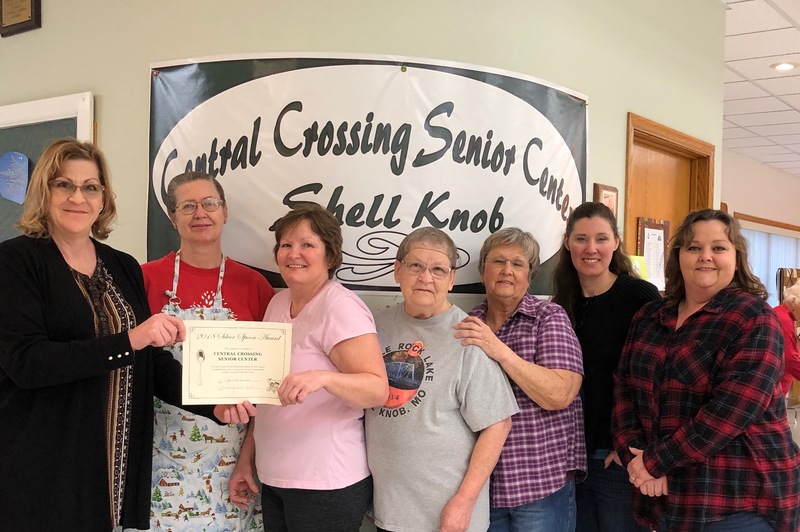 Merry Smith, Branch Manager of Service 1 Federal Credit Union in Shell Knob was presented a plaque recognizing the Credit Union as a continued Gold level Business Partner of the Central Crossing Senior Center (CCSC), located in Shell Knob. The plaque recognizes this level of support for the year 2019. Service 1 Federal Credit Union’s generous level of support will go a long way toward improving the day-to-day management of the CCSC. Area seniors benefit greatly from the sponsorship afforded by our business partners. People like Merry, Julie and Abbey at the credit union are all community-minded and on behalf of Shell Knob Seniors, Inc., the Barry and Stone County seniors wish to say, “Thank You!” Service 1 Federal Credit Union is located on the lower level in the Bridgeview Plaza with entrances at parking lot level as well as the lower level. Pictured above, left to right, Gina McIlrath, Shell Knob Seniors, Inc. board member and Merry Smith, Branch Manager, Service 1 Federal Credit Union. The Dogwood Trail Garden Club is noted for reaching out to the community with their skilled master gardeners. 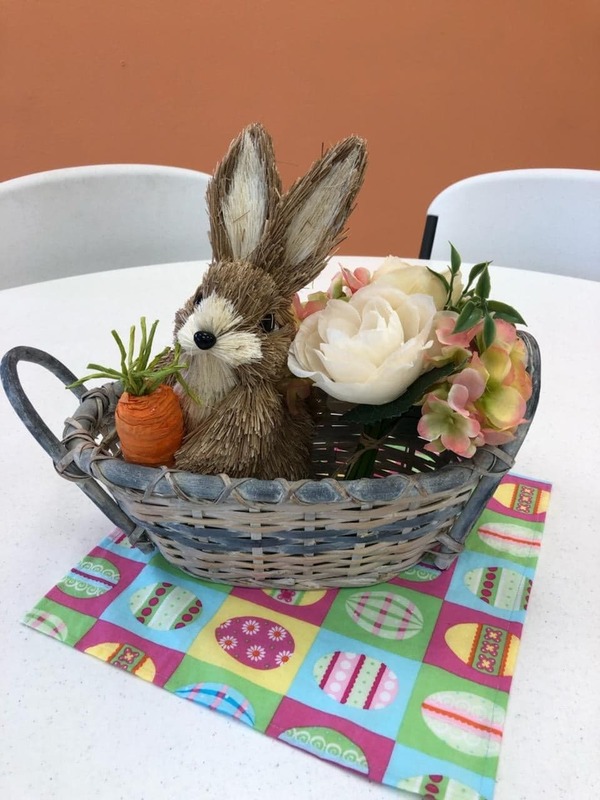 This time, they decorated all the tables at the Central Crossing Senior Center with Easter themed center pieces for the enjoyment of the entire lunch crowd and all who use the dining rooms for the many events offered at the Center. These talented individuals give selflessly of their time for this and other occasions and really the entire growing season as they accomplish all the professional-looking landscaping at the Center as well. A big thank you to the dedicated volunteers of the Dogwood Trail Garden Club! You really brighten our days! 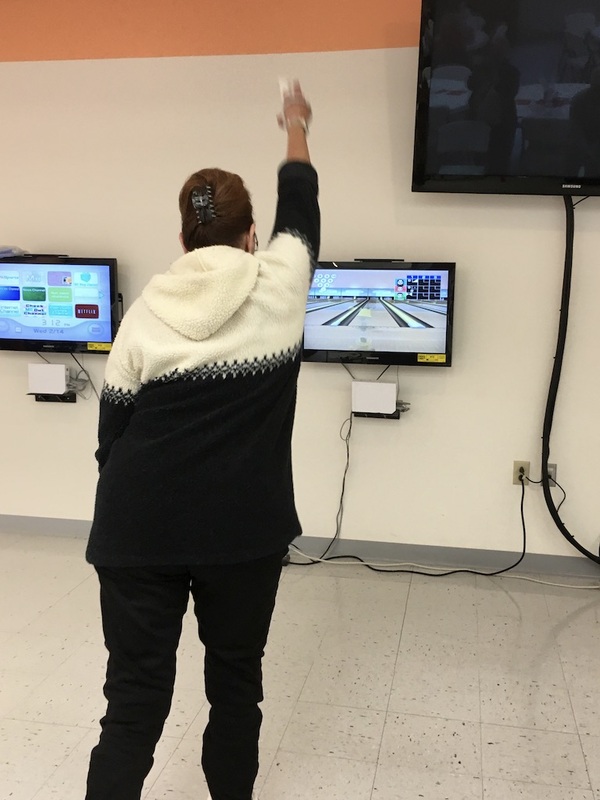 As you can see, Central Crossing Senior Center offers something for everyone and wellness for both the mind and body! All activities and most services are free. In addition, Monday through Friday, the Center offers nutritious and delicious meals complete with an extensive salad bar, all at a very nominal cost. Located on YY15 in Shell Knob, please call 858-6952; visit us online at: www.shellknobseniorsinc.org; or come on in for a tour – you’ll be amazed at all that Central Crossing Senior Center has to offer! And remember, we’re here for YOU! 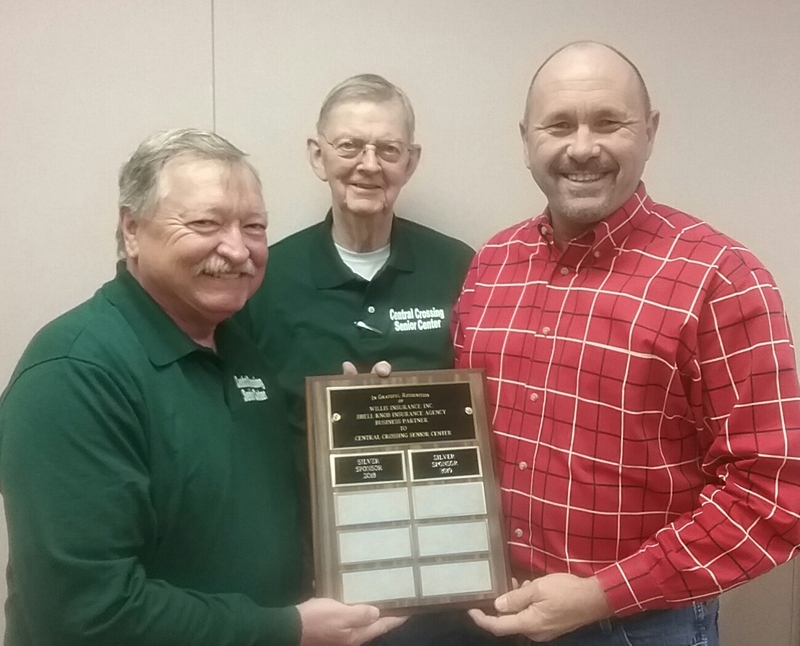 Andy Reavis, co-owner of Willis Insurance, Inc. (which owns Shell Knob Insurance Agency) was presented a plaque recognizing the company as a continued Silver level Business Partner of the Central Crossing Senior Center (CCSC), located in Shell Knob. The plaque recognizes this level of support for the year 2019. Willis Insurance Agency’s generous level of support will go a long way toward improving the day-to-day management of the CCSC. Area seniors benefit greatly from the sponsorship afforded by our business partners. 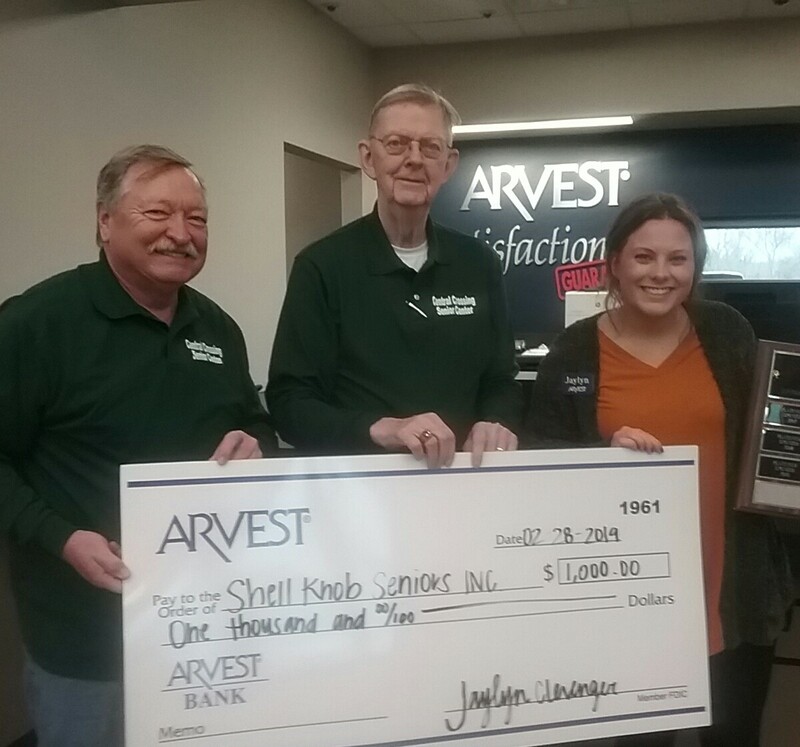 People like Andy Reavis, co-owners, Annette Henderson and Jeremy Marple are community-minded and on behalf of Shell Knob Seniors, Inc., the Barry and Stone County seniors wish to say, “Thank You!” Shell Knob Insurance Agency is located in the Bridgeview Plaza next to the library. 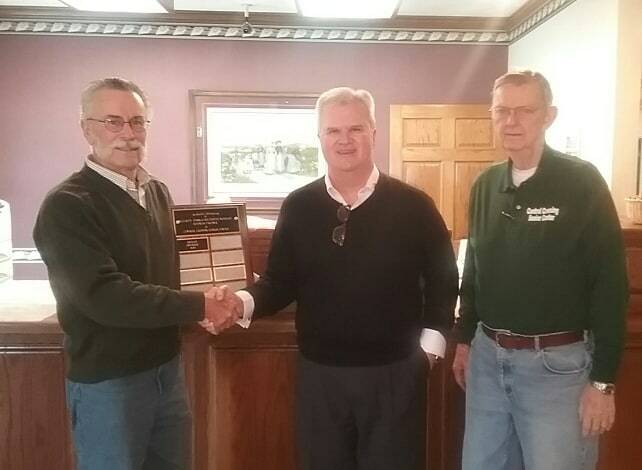 Pictured above, left to right, Sam Herkelman, Chief Operating Officer, Shell Knob Seniors, Inc.; Jerry Arnold, CEO, Shell Knob Seniors, Inc.; and Andy Reavis, co-owner, Wilis Insurance, Inc.; Willis Insurance, Inc., Shell Knob Insurance Agency. Jon Horner, President of Security Bank of Southwest Missouri, was presented a plaque recognizing the bank as a Silver Level Business Partner of the Central Crossing Senior Center (CCSC), located in Shell Knob. The plaque is the official recognition of Security Bank’s level of support for 2019, but in reality, Security Bank has supported the Senior Center for years prior to that and their generosity helps to both improve the facilities as well as the day-to-day management of the CCSC. Literally hundreds of area seniors regularly benefit from the ongoing generosity of business partners like Security Bank. Their contributions and commitment ensure the multitude of services and programs enjoyed by so many will continue well into the future. Indeed, our business partners are in large part responsible for making Shell Knob such a wonderful place to live! Security Bank of Southwest Missouri, with offices in Cassville, Exeter and Wheaton is to be commended for being so community minded. Thank you Jon and thank you to Security Bank! Pictured above, left to right, Jeff Harp, Chief Publicity Officer, Shell Knob Seniors, Inc.; Jon Horner, President Security Bank of Southwest Missouri; and Jerry Arnold, CEO, Shell Knob Seniors, Inc.
Jaylyn Clevenger, Financial Sales Representative, Arvest Bank Shell Knob, was presented a plaque recognizing Arvest Bank as a Platinum level Business Partner of the Central Crossing Senior Center (CCSC), located in Shell Knob. The plaque recognizes this level of support for 2019, but in reality, Arvest Bank has generously supported the Senior Center for years prior to that and their level of support has gone a long way toward improving the facilities as well as the day-to-day management of the CCSC. Area seniors have benefited greatly in large part as a result of Arvest Bank’s ongoing, generous support and partnership. A huge thank you goes out to Arvest Bank for their area support of our Senior Center! 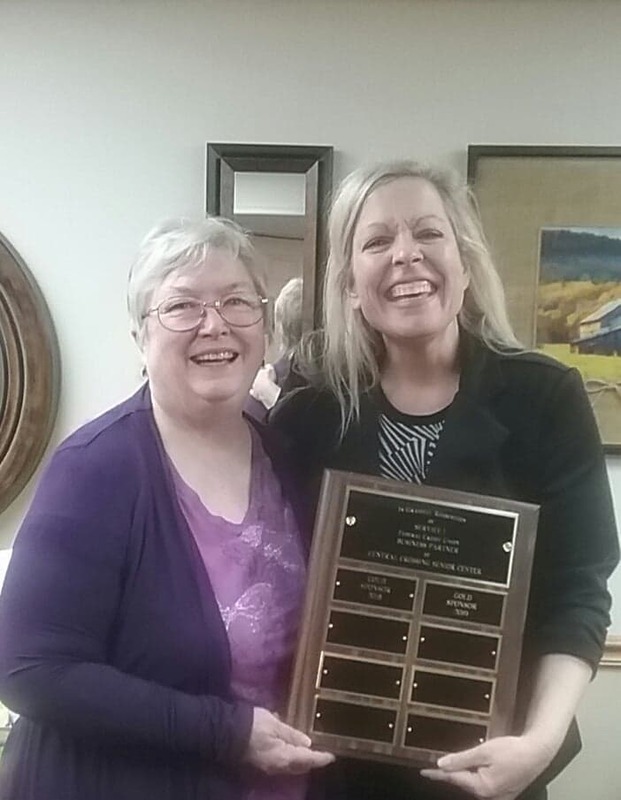 The Thrifty Closet was recently recognized as a Platinum Level Business Partner with Shell Knob Seniors, Inc. 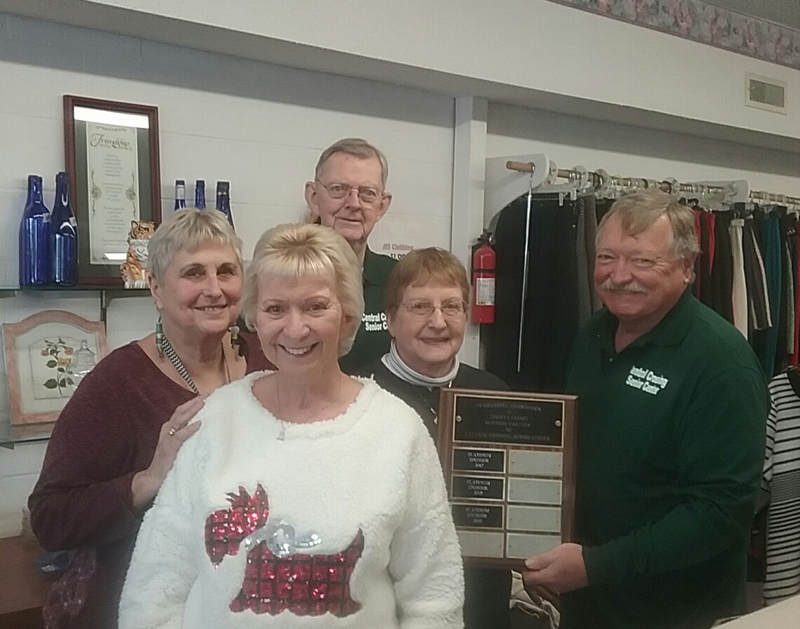 Since the inception of the Business Partners Program, Thrifty Closet has been recognized as an integral partner with the Central Crossing Senior Center. For years now, they have contributed generously to the salad bar at the Center. If you’ve ever eaten at Central Crossing Senior Center, you’ve undoubtedly noticed it consistently provides one of the finest salad bars in the area. This salad bar is not funded by Senior Age, but rather depends entirely on the generosity of the individual diners and others such as the Thrifty Closet. Thrifty Closet is an outreach ministry of the United Methodist Church of Shell Knob. The community is indeed blessed by organizations such as the Thrifty Closet and is just one more reason Shell Knob is such a great place to live! 1/31/19 -Shell Knob Seniors, Inc. unveiling new website! 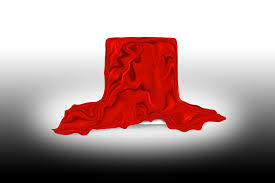 Shell Knob Seniors, Inc. (SKSI) is happy to announce it is unveiling a new, revised and much improved web-page! On or about February 1st, the SKSI’s totally revised website, www.shellknobseniorsinc.org will be up and running. The website replaces the older version and has numerous upgrades. This new, revised website will be updated regularly and include videos of current activities and programs, current lunch menus, upcoming activities, all news-related articles as well as archives of past articles and activities. 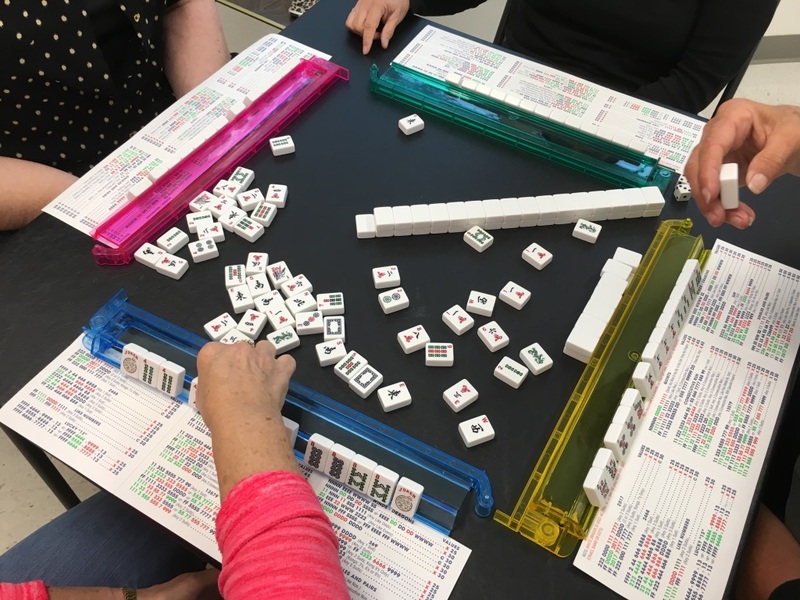 While most people associate SKSI with Central Crossing Senior Center, Mountain View Estates (MVE) is also an integral part of what Shell Knob Seniors, Inc. is about and visitors to the website can find out more about the exciting new MVE senior housing development. The site is extremely easy to navigate. So keep watching and be sure to log on and bookmark this web-page as it should be up and running by the time you read this article. There are a lot of exciting things going on at SKSI and we want to be sure you don’t miss any of them! Just type in www.shellknobseniorsinc.org; bookmark the page and check it out frequently. You’ll love it! Central Crossing Senior Center was presented the coveted Silver Spoon Award by the Barry County Health Department for zero health violations in the kitchen and dining facilities for all of 2018! This is a high honor and is only awarded to permitted food establishments which have demonstrated sustained excellence in public health food safety. In other words, you can enjoy dining at Central Crossing Senior Center and be assured that you are eating in a safe and healthy environment. Attaining this award is a team effort by employees and volunteers alike. It takes training, commitment and attention to detail to attain this degree of recognition. A big thank you to all involved for your efforts! You have every right to be proud of your Senior Center’s dining room and kitchen! We hope to see you for a safe, healthy and delicious lunch real soon!